In the summer of 2015 NASA released the first stunning images from New Horizon’s flyby of Pluto. I was mesmerized. The near-true-color images were stunning enough, but when NASA later released composite images in false color, the internet community couldn’t get enough. 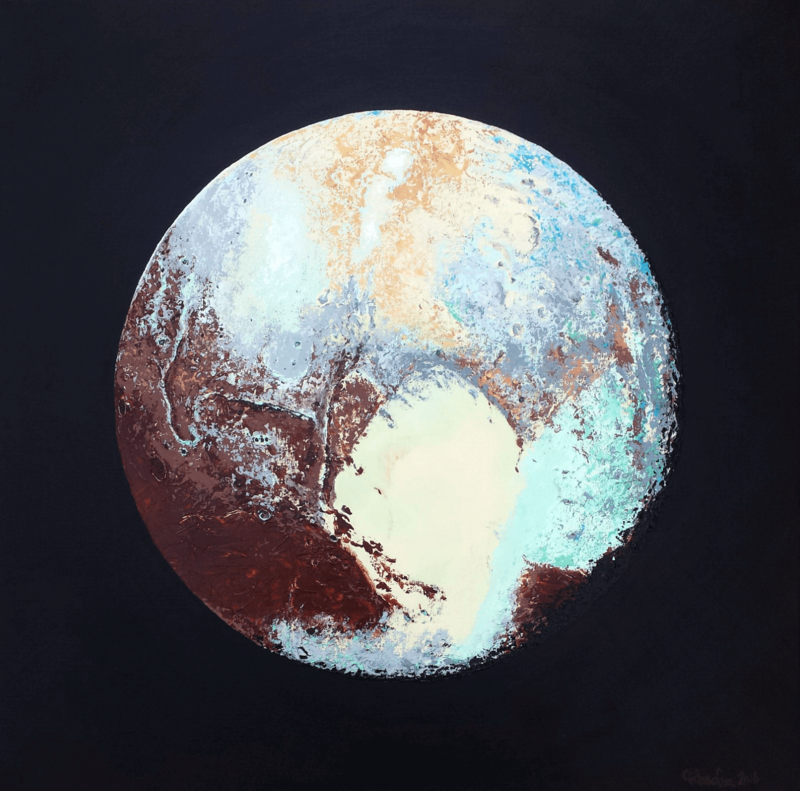 Pluto was everywhere, and the moment I saw my first false color image I knew I had to paint it. What I didn’t know was how quickly that would happen, and under what synchronistic circumstances it would take place. I began Tales from Ovid’s Metamorphoses on 11 Oct 2015, as the moon entered its new phase in sidereal Virgo and Pluto in Sagittarius trined the Jupiter-Mars conjunction in Leo, the sign of both creativity and true love. I chose the date as the first new moon after Pluto began direct movement in September. The Jupiter-Mars trine from Leo was a fortuitously supportive aspect, both in the sense that I was initiating a creative undertaking, but also one that would, with its underlying theme of romantic love, tie in beautifully with events that would transpire months later. So I built the frame, planed it, got everything stretched and sketched, and before I could put down a single stroke of paint, life got in the way. I had my heart set on taking advantage of the Jupiter-Venus conjunction taking place toward the end of October. The Venus Conjunct Jupiter series was—and is—still in process, so Pluto was bumped from his position of primacy on the easel in favor of his brother Jupiter. My plan for both paintings was to work in oil in preparation for an event in late 2016—I wanted to have several oil paintings done and drying so that I could move on to faster media the closer my event deadline came. November came and went with its busywork of custom commissions and other business, and before I knew it (probably before you knew it, too) the first week of December had come and gone. Out of the blue—thanks, Uranus—a surprisingly unfiltered post about the Women’s and Children’s Alliance 2016 art auction and fundraiser hosted by the Art Source Gallery flitted its way down my Facebook feed. Theme? Metamorphosis. Deadline? December 12th?! How would I ever make that? What on earth could I make in six days that would fit the theme of metamorphosis? I brought it up to my husband over breakfast the next morning. I was familiar with the WCA’s mission from my previous work with another nonprofit, and a little disappointed to miss an opportunity to help. Do it, he says. You can make something in six days. Yeah, I can. But what? I had kept myself awake in bed the night before trying to think of what. But wait. Pluto. All-sketched-out-and-not-a-drop-of-paint Pluto. Pluto. Pluto the Destroyer. Pluto the rebuilder. Pluto, the astrological harbinger of transformation. Of course. Pluto. And thankfully fresh canvas, no oil paint on it at all—which meant I was free to shift gears and paint it in acrylic, a bit ahead of schedule. Thanks, Uranus! In Book V of his Metamorphoses, the poet Ovid recounts a version of the rapture of Proserpina. The Roman mythology describes Pluto’s love of Proserpina, triggered by the arrow of Cupid, causing him in his obsession to kidnap Proserpina and spirit her away to the underworld he rules. The daughter of Ceres, a goddess of spring, and of Jupiter, the tale of Proserpina is the archetypal story of the seasons: of life, death, and rebirth. Mourned by her mother who holds the earth hostage in the death of winter awaiting Proserpina’s return, Pluto relents—halfway—and allows Proserpina to return to her mother for six months of each year. He ensures her return to him by commanding her to eat six seeds of a pomegranate—one for each month she must return to him—for those who have eaten the food of the dead cannot return to the world of the living. Ensconced as his queen, they rule the dead as equals—and unlike many mythological marriages, loyal to each other: jealous, or obsessive, even. In a bit of lovely synchronicity, Pluto danced in sextile to the asteroid Prosperpine during the creation of this painting, waltzing first retrograde then direct. I wrapped up major painting leading into the December 12th new moon (in sidereal Scorpio, Pluto’s home turf—the sign of death). The final varnish will be completed as we head into the December full moon in Gemini. Entitled Tales from Ovid’s Metamorphoses, this 2″ deep hand-stretched canvas measures 25″ x 25″. It exhibited at the Women’s and Children’s Alliance benefit show Metamorphosis, hosted by Art Source Gallery, 1015 Main St. Boise ID in January 2016.